A recurring pain point during the remittance process is the additional fees and bank charges customers unwillingly incur just to transfer funds. SingX, which aims to be the AirBnB of cross-border global payments, aims to solve this problem head on by offering a cost-friendly alternative. SingX’s online remittance service enables Singapore-based consumers and SMEs to transfer funds to overseas markets. The fintech startup's peer-to-peer technology responds to the currency exchange requirements of customers thus eliminating the need to convert from one currency to another. Customers are then charged at a low handling fee of 0.5% as opposed to exorbitant mark-ups which could range from 5% to 15%. "It aims to disrupt the Global Payments market with a peer-to-peer remittance platform which will, over time, eliminate the need to convert one currency to another and further reduce transaction costs," SingX principal founder and CEO Atul Garg said in an earlier interview. A banking and payments veteran with over 25 years of experience, Garg previously served as General Manager of American Express where he spearheaded the management of payment franchises in South Korea, India and other emerging markets. SingX recently closed its second funding round last year where it raised $4.5m to power its overseas expansion into Malaysia and Hong Kong. 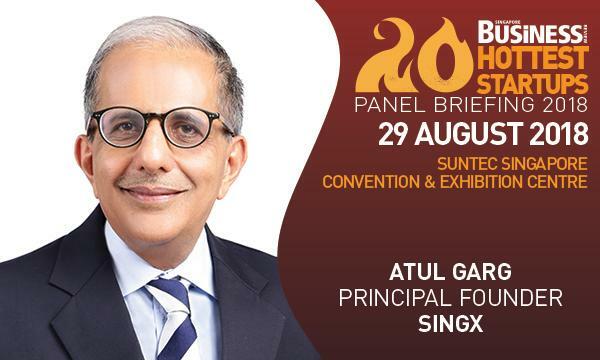 In an exclusive interview with Singapore Business Review, Garg discusses SingX exponential growth and vision for startups aiming to replicate his success. My helper, who has been with me for the past 10 years remits money back home to Indonesia every month. I realized she has to spend almost 3 hours to conduct the transaction, as she has to go physically to the remittance outlet. On top of that, she was paying a hefty mark up on the foreign exchange rate and other fees that she was not even aware of. Thinking about this, I realized that most of us who remit money are unaware of the hidden charges from existing remittance providers and found it unfair to be charged 5-15%. Looking deeper into the problem, I discovered that the global payments industry is estimated at US$30 trillion (growing at 10% per annum) and affects a multitude of consumers and businesses. I also discovered that Asian foreign exchange involves a dual conversion with the US dollar as settlement, further driving the rates up for consumers. Hence, there was a significant opportunity to disrupt the global payments industry by providing more value to consumers. I, together with a group of like-minded banking professionals, conceptualized a new way to transfer money overseas affordably, quickly and conveniently. Through these discussions, SingX was born with its first office in Singapore. This will be in line with the Panel Discussion Topics – and we can share details closer to the date.